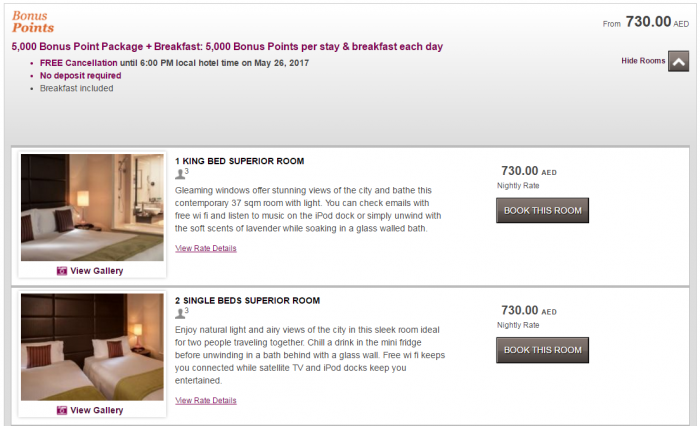 IHG Rewards Club has launched breakfast inclusive Bonus Points Package-promotion for stays in Dubai and Abu Dhabi until June 30, 2017. Members that book this specific rate plan earn 5,000 bonus points per stay (these points are elite qualifying) and can be earned unlimited times. You can access IHG’s web page for Bonus Points Packages here. 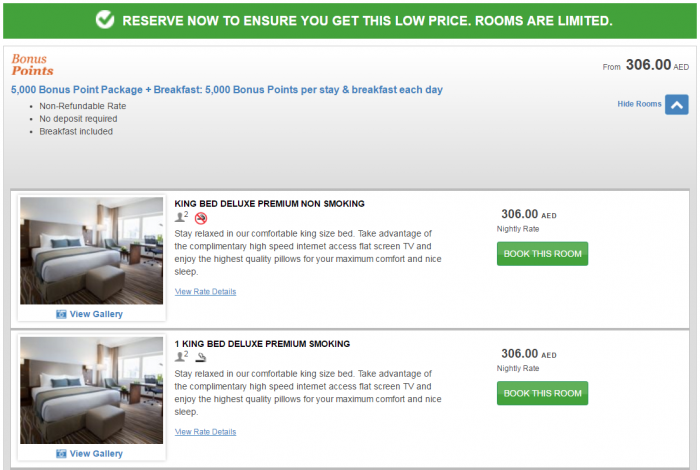 You have to compare the rates without these bonus points to find out if it makes sense to book them keeping in mind that these points are elite qualifying. This is Ramadan time in the Muslin countries and this many hotels are struggling with occupancy rates. Rates are limited and subject to availability. Bonus points or miles will be awarded upon the terms of the Bonus Points Package and completion of stay. A stay is one or more consecutive nights at the same hotel regardless of frequency of check-in/checkout. Only one member per room will be awarded the applicable bonus points or miles. You must be a miles collector with a preferred earning alliance within your IHG® Rewards Club member account in order to collect miles for staying at hotels in the InterContinental Hotels Group system. If you are a miles collector, please see chart below for mile conversions. All airline programme terms and conditions apply. Package components may vary by region and by hotel. Any unused components of the package are non-refundable. No retroactive points or miles will be awarded for nights stayed prior to enrolment. Blackout dates may apply. Rates are per room, per night, and extra person charges and rollaway bed charges may apply. Other restrictions may apply. Rates do not include taxes, gratuities, or incidental charges, including food and beverages. Chase Bank USA, N.A. is not responsible for offer fulfilment. See website for full terms and conditions. Next articleWould You Visit North Korea? I Will, This Week.